The Koans of Zen's World are normal stories. OK, not that normal. They were written in medieval China. Sometimes you need to know something about this background, most of the time you don't. Legends and mysteries, strange events in Buddhist monasteries or just riddles, that's what Koan stories are about. 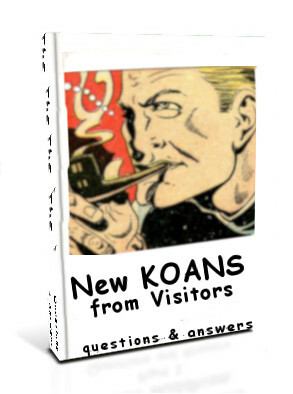 But, unlike riddles, Koans have no answers but only a meaning, which is the Koan solution. More information below. If you run into problems: Meditation might be helpful. A robber comes into a monk's room at night. There's nothing to steal but a talking tree in one corner. Nice little story, but what does it mean? That's exactly the question of every Koan-story: What does it mean? To answer this question is to answer the Koan. You will absolutely fail with a straightforward, logical or smart answer. "The robber just steals the tree" or "never try to rob a monk", this kind of answer won't do in Zen. The answer can only be found in "Zen's World". The base layer of reality, the bedrock of the world (in history, today and in future), that's what some Buddhists call "Zen's World". Unfortunately reality is much too big to explore down to its bedrock. Koan stories are not "reality" as such, but they represent it sufficiently well to find the base layer, Zen's World. 1. Down there only "real" things can be found, e.g. trees and houses, birds and people, cars and horses, rivers and oceans, men and women. 2. All relationships between these things, comparisons, measurements, values, laws of nature and society fall away. There's no room anymore for questions, debate, definitions, competion. 3. In addition, "things" on the bedrock are reduced to patterns. On a screen these become black shapes, lines and dots. Welcome to Zen's World, where only the "bare bones" of reality exist. The "real" things of the talking tree Koan are two people and a tree. Everything else is gone. They are represented by patterns of black shapes, lines and dots. These are the bare bones of the "Tree Koan" in Zen's World. But hang on, there's somebody else that has to be included: the "Person" that wants to solve the Koan. "Person" is also a black shape (For more information go to The Person that calls itself 'I'). In this form, Person is able to join the Koan and to convert itself into every other one of the Koan's black shapes. In this Koan Person may intermingle with the black shape of the tree. Later, back in the real world, Person will act as tree. Rasing the arms, moving like a tree in the wind. That's the Koans' meaning: be a tree! Warning: If you are not happy with the meaning you found, don't start thinking about a better one, but meditate until you're satisfied. The explanation of the tree solution could be: don't be distracted by mysteries. Person is the tree, the tree is Person. They are not two but one. To trust in this kind of solution is a big step. But it's needed. Only Person is able to enter Zen's World, intuitively catch the Koans' meaning and present it.